Weather you work in Picas or Points, there comes a time when you need to convert from 1 to the other. 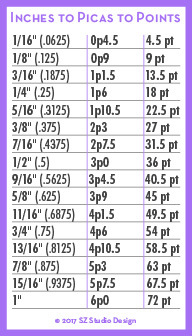 Here is a hand conversion chart for you. It's also placed on the Free Design Tools Page.